As an experienced accountant in Durham, our accountancy and bookkeeping services lie at the heart of our business and are the foundation to everything we do. We deal with sole traders and partnership businesses in the Durham area, as well as Limited Companies; the most popular trading vehicle we recommend. We encourage our clients to maintain as good a set of books and records as they are able. We will review your current systems and find the best solution for you. Good book and record keeping is essential so that accounts can be submitted to HMRC and Companies House in a timely manner. It also provides good management information to the company owners and can quickly satisfy queries from HMRC should the need arise. My bank manager recommended me to go and see Avery Martin when I was thinking of starting up in business. We managed to get the finance we needed and the rest is history. 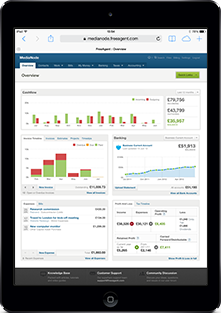 We can set up any accounting system from a simple spread sheet operation for a sole trader to a fully integrated cloud based accountancy solution for a large company turning over several £million. We aim to file all accounts within 3 months of your company year end and request that you provide all records required by us, in good time. Many new and developing companies need more information in order to make management decisions and monitor profitability. To facilitate this, monthly or quarterly accounts may be needed in the early years. We can help you develop your systems in order to ensure this information is at your fingertips. We review the data and make recommendations based on the trading results. Having good management information is key to the success of a company in the current economic climate. We will meet with you to discuss the reports, highlight any tax issues and review the business plan.